Characters in Star Wars Galaxy of Heroes are all unlocked at Level 1 and can be levelled to Level 85 through the use of credits. In this section we’ll review the stats increased with level increases and the attributed costs. With each level increased, characters receive an increase in Strength (STR), Agility (AGI), and Tactics (TAC) which generally improves overall character performance. All characters have different Growth Modifiers for each level increased. 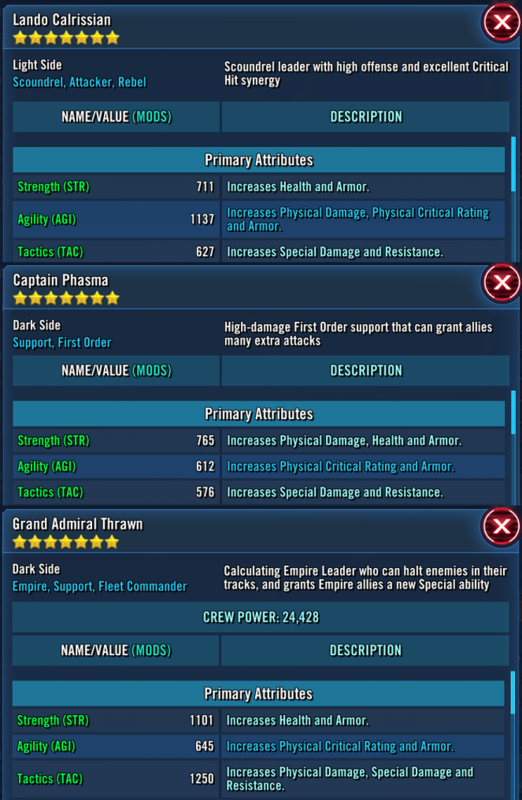 In the below example, Captain Phasma sees an increase of 7.1 Strength gained per level, while Lando Calrissian sees an increase of 5.3 Strength gained per level. This means that Phasma will get more of an increase in Strength each time she is levelled higher than Lando. That said, Strength is just **one** character stat and this does not mean that Phasma is necessarily stronger or better than Lando. Looking closer at their growth modifiers, Phasma gains 7.1 Strength per level which increases her Health, Armor, and Physical Damage, but Lando gains 8.0 Agility per level which increases his Physical Critical Rating, Armor, and Physical Damage. Different characters will have not only different Growth Modifiers, but those modifiers will also increase different things, with Physical Damage increasing on any of the three primary attributes. 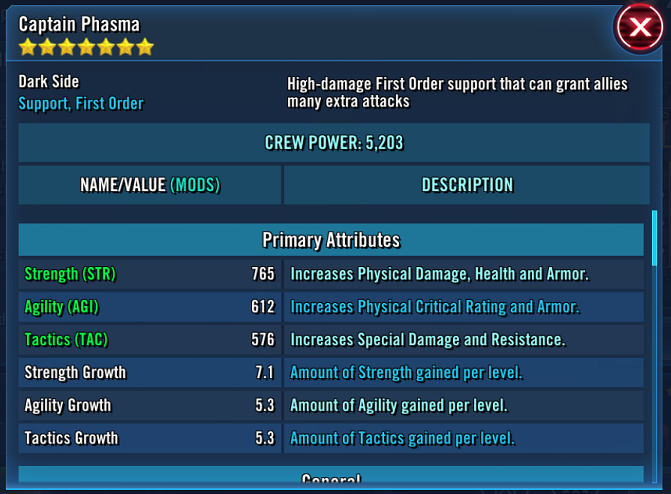 Below Phasma, Lando, and Thrawn each have Physical Damage increasing on each of the three attributes and at different rates. Overall, since different characters have different growth modifiers, all the level increases eventually balance for each character as they approach Level 85. To take a character from Level 1 to Level 2, the cost is 178 credits. To take a character from Level 9 to Level 10 costs 852 credits. 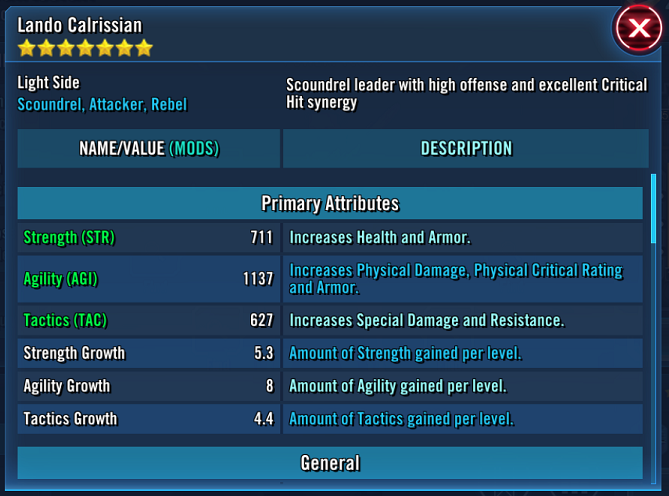 To take a character from Level 84 to 85 costs 355,000 credits! The cost from Level 84 to Level 85 is nearly as much as the cost from Level 1 to Level 48. The total cost from Level 1 to Level 85 is 6,269,478 credits. 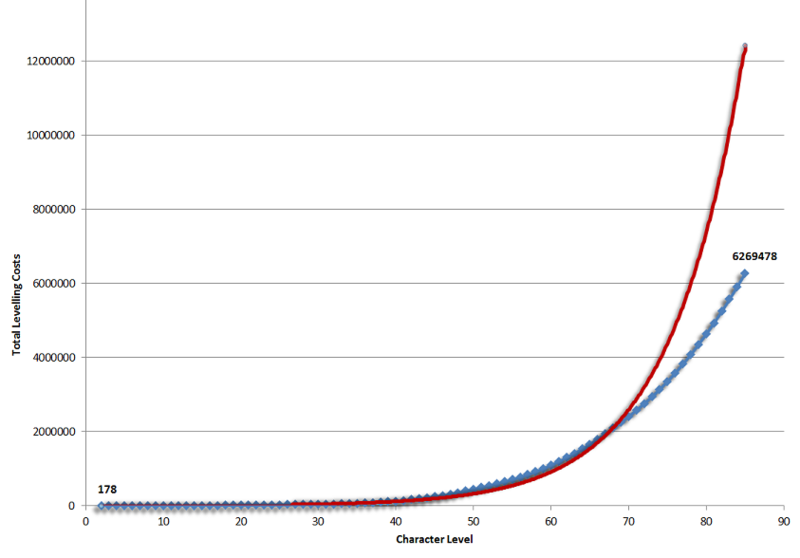 The exponential costs in levelling characters gains most importance in relation to character abilities and gear. Individual gear pieces can be locked behind different levels. 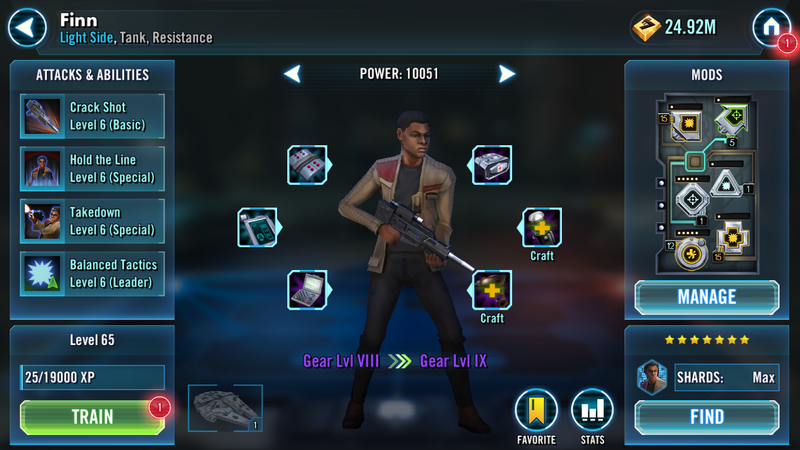 In the below example, the selected gear piece could be crafted and equipped on Finn, but this piece requires that Finn is at Level 65. Abilities can also be locked behind both Levels and Gear Levels. 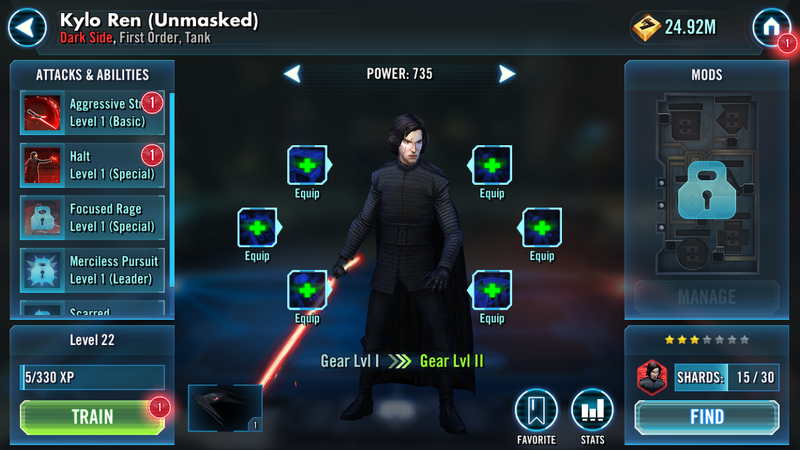 In the below example, Kylo Ren Unmasked’s (KRU) Scarred ability is locked until Gear Level 6, but KRU can’t be brought to Gear 6 until he reaches Level 42 when the last piece of Gear 5 can be added to him. What is most important to keep in mind with levelling characters is that levels cost a lot of characters. It costs 6,269,478 credits to take a single character from Level 1 to Level 85 and while few characters need to be at Level 85 for all the abilities and gear pieces are available, many do need to be at Levels 82-84. Looking at the below chart, it is easy to see how quickly the costs for levelling characters can go up…exponentially. A true exponential curve is even in red added for reference. Be sure to save your credits and try to avoid levelling characters for the sake of levelling them. While the costs are cheap in the first 50 or so levels, the costs get very expensive between Level 55 and Max Level.